Oh no, help me. Since seeing this I’ve had the chorus to “Livin’ on a prayer” going around in my brain. Mind you, maybe the words “Oh, we’re half way there” are appropriate for a tram trip. Weird that this is an articulated tram with an orange route screen rather than the normal green dot matrix seen on this class. 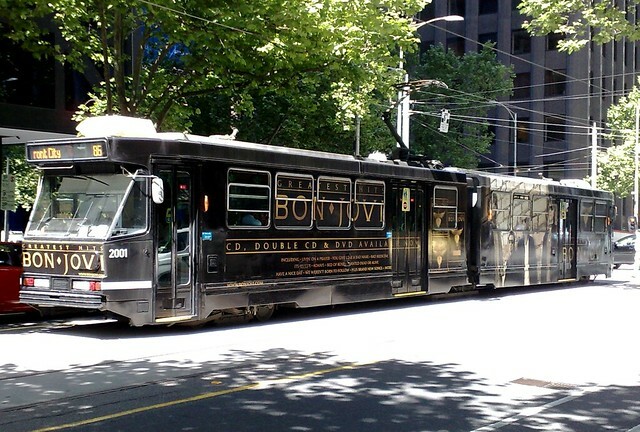 I’m assuming, in the interests of an integrated pt system, you’re advocating Bon Jovi on all trams, trains and buses? … and on an AC/DC tram you would be on a highway to hell ? Grrr! Did you have to put Bon Jovi lyrics into my head? Worst earworms ever!